Many will find themselves in the position once in a while where they'll need to take a taxi but don't know exactly how much the trip will cost. And this can lead to very unpleasent surprises at the end of the journey. What's even worse, you might not even have enough money to pay the fare. 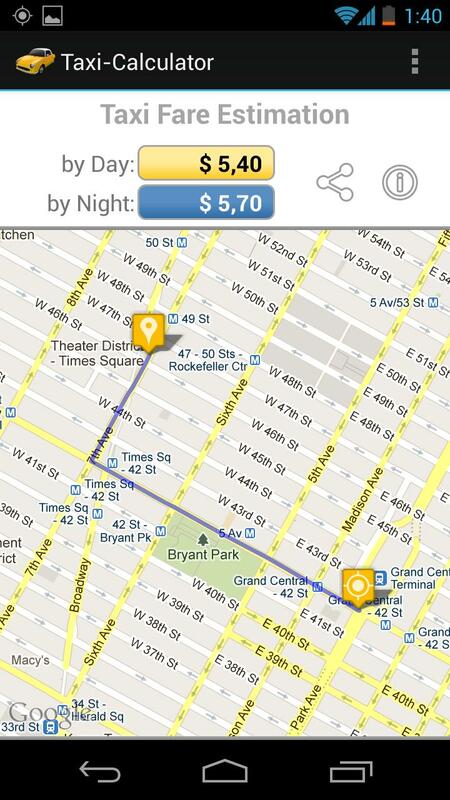 Taxi Calculator helps you plan your taxi route in advance right from your smartphone. To find out how exactly Taxi-Calculator works will be explained in today's app test review! 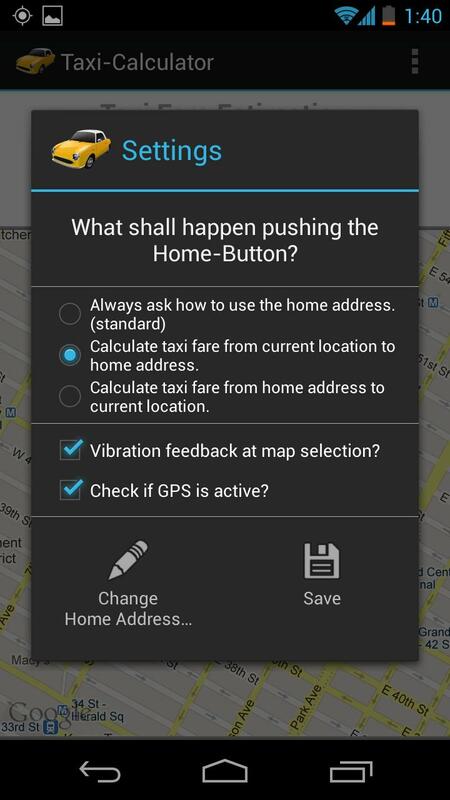 Taxi-Calculator takes up just under 1 MB of internal memory and requires very basic permissions that are only related to the app's functions, like current location for example. The app can then be installed without problems. 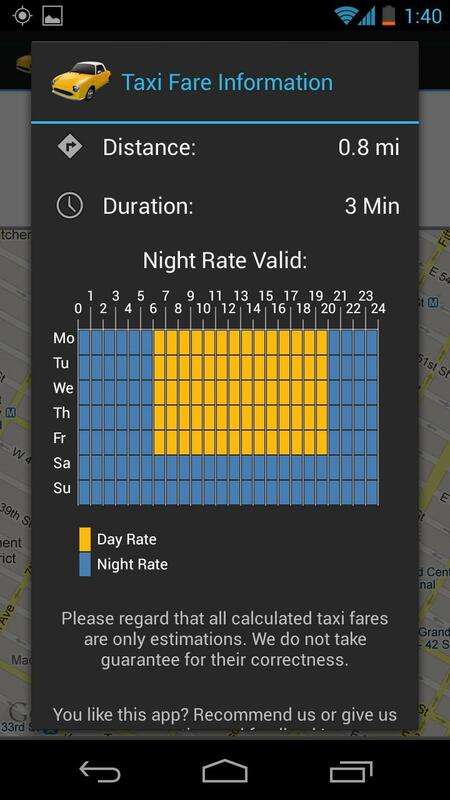 The app offers a quick overview of the likely costs that will be incured by your taxi ride by simpling entering the places of departure and arrival. As an alternative, you can choose the GPS location to define the starting point. You can also choose to indicate the starting location on a map. This comes in handy especially when you want to reach a street, whose name you don't remember. The estimated price is based on 290 different rates and takes into account the distance travelled by the taxis on the way. Of course, the price will be shown for both the day and night time. Direct Call options are also available within the app. The user can also save an address as ''home'' and then select ''take me home'' to calculate the cost of the route from your current location. In the options, you're able to determine if the address should be stored as the departure or arrival address or whether it should be specified everytime. You might ask yourself, how accurate is the estimated price? In principal, there's an oscilliation of 5% and given the average prices of each ride, I would calcuate that there's a 2 dollars difference, give or take. In general, the estimates were reliable and the app deserves to be installed on your smartphone, especially for those who use taxis often. Taxi-Calculator offers many great functions to calculate the cost of travel by taxi. The only comment to make is that the route is selected automatically be Google Maps and isn't neccessarily the shortest way. However, taxis drivers often opt for the shorter routes with with less traffic. In any case, most of the time the prices indicated by the app were accurate. Taxi-Calculator works intuitively. This app's design follows the standard Holo and all of the major functions are shown in the main screen. The different methods of entering addresses make it easier to select a route and the ability to contact several taxis companies in a few gestures make this app very comprehensive and complete. Taxi-Calculator always worked well and without any problems. 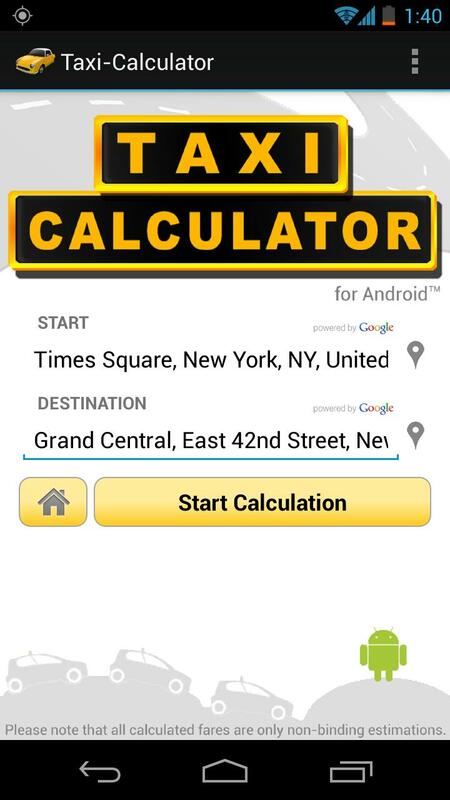 Taxi-Calculator can be downloaded for free from the AndroidPIT app center. The banner ads can be disabled via an option in the settings, making this app basically ad-free on the main screen. Really good features and seems to be an useful application. Since couple of weeks am using a mobile app called taxi mobility( http://www.taximobility.com ) which has several features about booking taxi online. This enables users and taxi owners to track their cabs with personalized panels.